Remember the journal entry we did where we jotted down some things we want in order to have our ideal life? We’re going to take that a step further. We’re going to create our Vision Boards. What exactly is a vision board? It’s a board (which can be a cork board, a piece of paper, a digital collage) that consists of only those things that we want in our lives. Pick only the things that demand a reaction of passion from you when you look at it and think about having it in your life. The purpose here is to focus on these things in your life and feel the joy and passion of having them. You should already have some ideas if you did the journal entry about your ideal life. Gather pictures, words, sayings, quotes, anything that aligns with your wants and passions. This is all about you, pick only the things that resonate with your goals. Remember* Use words as well as images, mix it up. Use affirmations and words that have meaning to your vision. The power of a vision board is a strong one. Take the time to sit and look at it and think about it and feel�your vision and your life as you’ve constructed it on your board. This is a super fun project and will get you focusing and thinking more about loving your life which in turn will have you thinking and feeling great! You can do this as a general life vision or make boards for specific events or areas of your life. Just be sure to keep your focus on what you really feel passionate about. (because this is my personal board I haven’t necessarily verified any licensing requirements to post images. 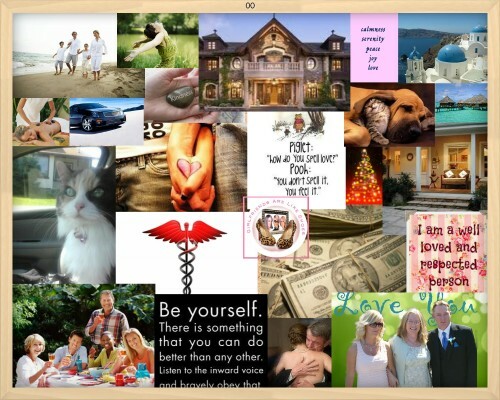 This is something to consider when making a digital board online) I used Oprah’s O Dream Board to make this one. A great tool to make digital collages is Pic Monkey�It’s free and easy to use. Join me on Pinterest here, I have 58 pinboards hehe. It’s a great place for inspiration and collecting ideas. Make sure to check out my vision board pinboard. Where do you go for images and/or inspiration? Please share your vision board tips here!